If there is one drumroll that most Americans recognize it is the familiar chord reformers have played for three decades: U.S. students score perform poorly compared to other countries in math, science, and other academic subjects. The familiar thrum drives the foot-tapping rhythm that reformers have used again and again to show that Shanghai, Seoul, Bangalore and Singapore graduates will out-innovate and out-compete U.S. ones. So the drumbeat over international rankings drumbeat gets played repeatedly. Largely ignored by many current reformers, however, is the 2010 United Nations Children’s Fund (UNICEF) report: The Children Left Behind. Playing off the name of the law that President George W. Bush signed in 2002, the title refers to inequality among children in rich societies. The data in the UNICEF report (PDF CHILDREN LEFT BEHIND) challenge the assumptions President Bush and bipartisan policy elites believed were unassailable when passing the legislation. That is, public schools can reduce racial and economic inequality by extending opportunity to succeed in schools for those on the lower rungs of the social ladder. Immigrant and poor parents believe this in their bones and have acted on it for decades. So have a legion of school reformers. Yet the report places the U.S. at or near the bottom of the list of 24 member countries of the Organization for Economic Cooperation and Development (OECD), a list composed of the world’s wealthiest nations. The report measures inequality in children’s health, educational achievement, housing and well-being. Thus, the report deals with the gap between the middle and the bottom. Such inequality, when it appears among rich nations, is–to some degree–avoidable, the Report says. After all there are nations that rank at the top–meaning they have reduced bottom-end inequality–while other wealthy nations at the very bottom have done little to reduce inequality. Policies, then, do matter. Surely, the metrics used and the all-important standard of measuring the distance between the middle and the bottom in a rich nation (see p. 32 of Report) leave room for debate as all international rankings do. After the report made headlines across the globe and was mentioned in the U.S. press briefly in December 2010, it dropped from sight. Nary a mention by reform-minded venture capitalists, edu-preneurs, business roundtables, national leaders or other card-carrying members of the policy elite. Sure, I know that the national attention span is in the nano-second range but here are data that show the U.S. in the basement when it comes to reducing inequality among children in rich countries. 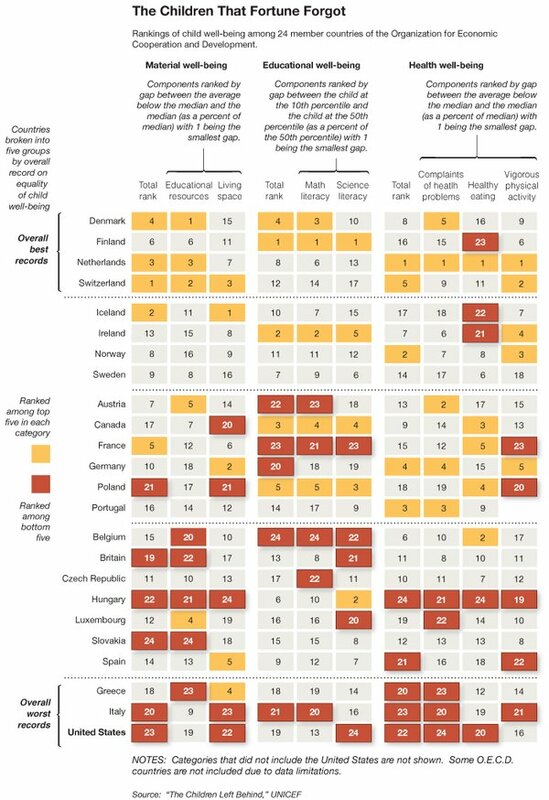 So often in the past, reformers select, polish, and spread evidence that blames public schools, especially, when international tests in science, math, and other subjects put the U.S. just above Bulgaria. But when evidence comes to light that some wealthy nations have put policies in place to reduce “bottom end inequality” where children’s health, housing, and other indicators of poverty are concerned and the U.S. has not, that news hardly raised an eyebrow among determined American school reformers. Why? With a history of putting onto schools the burden of solving serious national problems–a dysfunctional tic unique to the U.S.–it comes as no surprise that when TIMMS or PISA scores are released an earthquake of attention rushes through the media and blogosphere with aftershocks occurring for months. Reformers drag U.S. test scores into policy debates over charter schools, parental choice, pay-for-performance plans to show that these solutions are best. However, when a report such as The Children Left Behind points to national social, economic, and political structures (e.g., federal tax policies, governmental action on poverty, health insurance for the uninsured) that would need to be altered to reduce inequalities, silence spreads among policy elites committed to their school reforms. 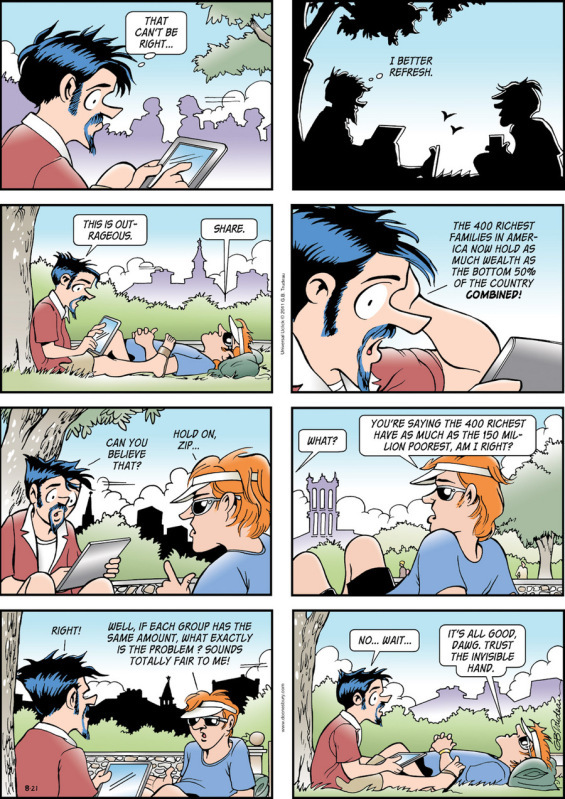 Maybe Doonesbury captures the stillness among reformers. Trusting the “invisible hand” to guide market-driven solutions in U.S. schools and classrooms is what current school reformers do when they follow the equation: better teachers + better schools= growing economy and reduced inequality. The Children Left Behind metaphorically raises the middle finger of another hand less trusting of market-driven solutions. As a principal in a school (K-5) with 90% free/reduced meals and 25% refugees, I noticed that the refugee population out performed the local poor students and very seldom had behavior problems even though they were also poor. I believe this was due to the fact that the people who make it here as refugees are somehow filtered as they have some qualities that allowed them to get out. Something like the jews who got out ahead of Hitler or survived the concentration camps. Refugee families are mostly two-parent families and in a case where something happened to one or both parents, the kids were taken in by other family members. I had kids whose parents were killed by Saddam Hussein that were adopted by aunts and uncles. The parents in these families have high respect for education and don’t want to hear about bad behavior. In the case of American poor families, they tend to have had bad experiences with education and their culture doesn’t seem to value it. In some cases the culture discourages educational accomplishment. When a child misbehaves, the parent is more likely to blame the school for picking on their kid than work with us to solve the problem. After a while they figure out we really care and work with us, but that is seldom the initial response. Having two parents who have high expectations seems to make a big difference. I’m not sure what the policy crowd can do to promote this, but I do think it should be their focus. You say blaming schools for society’s ills and burdening them with the solutions is uniquely American. It isn’t. They do the same thing here in the UK. Perhaps, David, I am too parochial when I say: “With a history of putting onto schools the burden of solving serious national problems–a dysfunctional tic unique to the U.S….” I wonder if you could give me some instances of policy rhetoric that UK decision-makers use that show the “dysfunctional tic” is shared. Thanks.